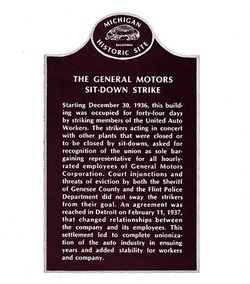 On February 11, 1937, GM, the largest industrial corporation in the world, yielded to the Flint Sitdown Strikers. General Motors recognized the UAW as the representative and bargaining agent of the striking workers. Historians describe the 44 day Flint General Motors Sitdown Strike of 1936-37 as the most significant event in the history of the Labor Movement. In the days and months following the Sit Down Strike there was to be no segment of American Industry, commerce or the professions to remain untouched as the visible rewards which worker solidarity provided became apparent. The Fisher Body Plant One was one of the largest plants in the GM empire, with about 8,000 working there in 1936. They represented about 1/6 of the total GM work force in Flint, the center of General Motors operations. Eighty percent of Flint families depended for their living on GM's Buick, Chevrolet, Fisher Body and AC Spark Plug plants. By contrast, only 122 GM workers in Flint were members of the UAW, all in Local 156. Since the corporation had systematically fired anyone who sympathized with the Unions, all 122 were believed to be spies, paid by GM to watch the other workers. The Fisher One workers showed their solidarity and militancy several times during that autumn. For example, two of the union supporters were fired in October, with company supervisors making no secret that the firings were for union activity. Bud Simons and other union leaders called on the men to stop work and demanded to see the Plant Manager. The manager, in turn, demanded to know just who did they think they were representing? To which Simons replied, "Mr. Parker, you may not know it, but you are talking to the union right now!" The workers stayed at their machines, but refused to go back to work until the two fired men were reinstated. This display of Solidarity sent a wave of hope through the Flint Auto Workers and they began to sign union membership applications increasingly. What triggered off the Great Flint Sitdowns was a secret move by the Corporation to prevent any work to Fisher One, because management had come to realize was a union hotbed. It was during the night of December 29, 1936 that the company supervisors began moving some important dies out of Fisher One. The next day a short, but important meeting was called of the Fisher One workers during their lunchtime. GM moving the dies out of Fisher One posed an immediate threat to the jobs, but also to the future of their union. GM planned to ship the dies to Grand Rapids and Pontiac, where the union was weak. That day was the eve of the New Year's holiday. If the workers went home after work that day, the company would be able to move the dies without any opposition. Moreover, if the workers engaged in a "traditional" strike the company would have little problem in getting the police to break the line. The only strategy that seemed to have a chance was the sitdown strike, with the strikers inside, prepared to fight for their jobs. The workers went right from this meeting back into Fisher One and took over the plant. They ushered the surprised supervisors out, and all workers who did not want to participate in the strike were asked to leave. When that was done, the gates were closed and the historic strike began. The gates did not open fully again until the workers had wrung from the giant corporation the recognition that their union existed and must be bargained with. The occupation of the plant was carried out with precision. The sitdowners were determined to leave the plant and the machines in even better condition than they had found them, against the day when they would using the facilities to produce GM autos again, only now as union members working under a union contract. Everyone of the nearly 700 who were sitting in at Fisher One had a responsibility, the Sit Downers became a self-disciplined community. Throughout their 44 days and nights in the plant, they were able to get help from their fellow strikers outside. In addition, help came for all the strikers from the thousands of dollars that was donated to them by other unions including the United Mine Workers, Amalgamated Clothing Workers and the Rubber Workers. Fisher Two was the smaller of the Fisher Body plants, but had a strategic importance far beyond its size. It was at the gates of Fisher Two that the Flint Police began the attack which ended in their complete rout. The battle is famous in the annals of labor history as "The Battle of Bulls Run" or also "The Battle of Running Bulls. GM must have felt that the 200-300 sitdowners in Fisher Two would be easier to oust by force. In addition, the workers only held the second story. The ground floor was held by company police, who hadn't been evicted at the start of Fisher Two's strike, which was started shortly after Fisher One. It began on January 11, 1937 when a contingent of 22 plant protection guards arrived at the Fisher Two gates. Simultaneously, the heat in the plant was shut off. GM had not shut off the heat up to this time because of the risk of freezing and bursting the water pipes, and also because the sitdowners had threatened to build wood fires in the shop, if necessary. In addition, company guards removed the ladder that was used for communication with the strikers. Previously the guards on the ground floor would open the front door twice a day to allow the outside picketers to bring in food for the sitdowners. However, on this day, they barred the front door and didn't allow anymore food in. GM was forcing a showdown, on the 13th day of the strike. Word came to the union headquarters and the leaders immediately strengthened the picket line around Fisher Two when they heard that the Flint Police were gathering in force nearby. Victor Reuther drove his sound car, an old Chevrolet with speakers attached to the roof, to the plant by back alleys, so as to avoid the police. A large group of about 30 strikers was sent down to ask the guards to open the gate and allow delivery of food waiting outside. The outnumbered guards made no objection; they stood aside and left the gate area. Afterwards, it was learned that they spent the night in the women's bathroom after notifying the police that they were "being held captive" by the sitdowners. A cheer went up when the sitdowners appeared at the gate to receive the food from the union's supply truck. The pickets, now over 150 strong, resumed their march after the sitdowners took the food in and shut the gate. From the second floor, they joined with the outside pickets in singing the labor's anthem, "Solidarity Forever"
Then the police struck in force. They came over the railroad tracks between Chevrolet Plants Four and Five and down Chevrolet Ave toward Fisher Two. Slowly advancing squad cars, filled with armed and gas-masked police were followed by additional police walking behind, throwing tear-gas shells into the picket line and through windows of the plant. The sitdowners had been prepared for such an attack. They had all the fire hoses ready to freeze the attackers with ice-cold water. They had also stretched inner tube rubber between steel bars mounted on the roof. These improvised sling shots would hurl car door hinges, that weighed 2 pounds each. To prevent forced entry the sitdowners had barred the second-floor doors with dollies loaded with steel. The outside pickets did their part, pushing back even as police clubs and tear gas shells pounded them. But, frozen by water, and pelted by hurling hinges, the police finally retreated across the bridge to regroup. The sound car was a major weapon, with Vic Reuther pouring courage to the strikers over the loud speakers. So effective was the sound car, that they directed their second attack to the car to silence him. Marching toward the crowds this time they threw gas shells into strikers and onlookers alike. The pickets had used the time in between attacks to gather up rocks, pop bottles, hinges and any other debris that could be used as a weapon, and many of the onlookers joined in with the strikers, beginning to pelt the attackers. Facing missiles on the ground and hinges and high pressure water jets from the plant roof, the attackers retreated for the second time. But, tragically, this time the police used their guns, firing directly into the ranks of the pickets. Many fell wounded. When the third attack came, the strikers had carried their wounded to safety and built barricades at both ends of Chevrolet Ave. Many of the autos turned over to make barricades belonged to the picketers themselves, who were ready to sacrifice all. The third police attack came in heavy strength, firing long-range tear-gas missiles across the barricades into the midst of the pickets. But the union still had a great resource to call on: Their Women. The UAW Women had organized themselves into a Women's Emergency Brigade under the leadership of Genora Johnson. The Brigade was active in every phase of the strike, including the picket-line duty. Now, in the midst of the choking defenders, Genora took the microphone in the sound car and appealed to the women in the onlooking crowd to join in the fight. Many did, and the attacking police found themselves fighting men and women alike during the long night. Eventually, the police withdrew. The strikers stayed alert for another attack, but it never came. The Battle of the Bulls ended. Sixteen strikers and eleven police officers were wounded, 13 of the strikers seriously, with gunshot wounds. The occupation of Chevrolet Plant Four was the turning point of the Great Flint Sitdown. It broke the corporation's adamant refusal to bargain. The historic first agreement, ending the long siege, came just 11 days after the workers took Chevrolet Four. The taking of Chevrolet Four was in response to a court injunction ordered by Judge Paul V. Gadola, who ordered the sitdowners out within two days, pn pain of a $15 million fine against the UAW and forbade even peaceful picketing outside. The Flint union leaders realized that their strike might fail unless they acted immediately. They needed to prove to GM that the union could spread the strike at will, to more and more plants, and particularly to a plant of vital importance to continued GM production. Chevrolet Four was the answer. It was the only GM plant making Chevrolet engines for all the assembly plants in the country, so a strike there would almost immediately halt assembly of Chevrolet cars, GM's biggest moneymaker.The problem was how to take the plant. Because of it's importance to GM, it was heavily armed and guarded. The strategy the leaders devised has been called one of the most daring and spectacular in the history of the labor movement. They asked union members at a different plant, Number Nine, to stage a strike, certain that these plans would leak out to the company. They hoped that GM would move the guards from Chevrolet Four to Nine to protect what would turn out to be the wrong plant. It worked! The company moved most of it's guards from Four to Nine. And sure enough, when the union leaders pulled the switches at shift break and announced a strike, the company was ready for them. Simultaneously, outside Plant Nine was a long line of noisy picketers. With Roy Reuther and Powers Hapgood cheering them on from the sound car, the outnumbered strikers inside Plant Nine fought the plant guards. The pickets outside used their signs to break the windows and let in fresh air to help dispel the tear gas used by the guards. The strategic moment arrived, in the sound car Roy Reuther gave a pre-arranged signal to Ed Kronk. Immediately, a group of pickets quietly moved away from the line and headed for Chevrolet Four. They had come in from Detroit, where GM spies would be less likely to recognize them. The two groups met at Four's gates and quickly went in. As they did, a small number of union supporters at work inside Four pulled the switches to stop the engine line. They ran up and down the line, calling on the other workers to support the strike. After letting out those who wanted out, they barricaded the doors against the approaching guards. Outside, appeared a sound car and a group of picketers who had been quietly waiting for this moment. Chevrolet Four was secured, General Motors suddenly realized that its only source of Chevrolet engines was gone, and gone with it was the production of its most popular and quick-selling auto. The Women's Brigade played a vital role in the capture of Chevrolet Four. Led by Genora, the women gathered in force outside the plant and fended off an attempt by police to crash the gates, which had not yet been completely secured by the sitdowners inside. The Brigade proved to be an effective and militant force for the union throughout the Flint strike. The unsung heroes in the Chevrolet Four victory were the strikers at Nine, who had given up the battle there after a bloody beating by the plant guards. The Nine strikers had not been told in advance of the strategy plan. When they heard of the victory at Chevrolet Four, and understood their important role in it, they cheered, and marched to the picketline outside Four for a glorious reunion before going for medical care. There was no stopping the Union after that. Judge Gadola's injunction was not enforced. Most of Flint celebrated the union's victory. Negotiations between GM and the UAW began in Detroit on Feb 3. Eight days later, the First Agreement was signed.